Cheesy Chicken Enchilada Dip is super easy to make, it’s a recipe that you mix together, bake in the oven, and it is ready to serve. Cheesy chicken enchilada dip made with cream cheese, sour cream, green chiles, cheddar cheese, seasonings, and enchilada sauce. We are a family that likes our dips. Whether it is a dip for veggies or for chips it doesn’t matter we love them. When the kids come home for a visit I will usually make some kind of a dip for a snack when playing cards or games. 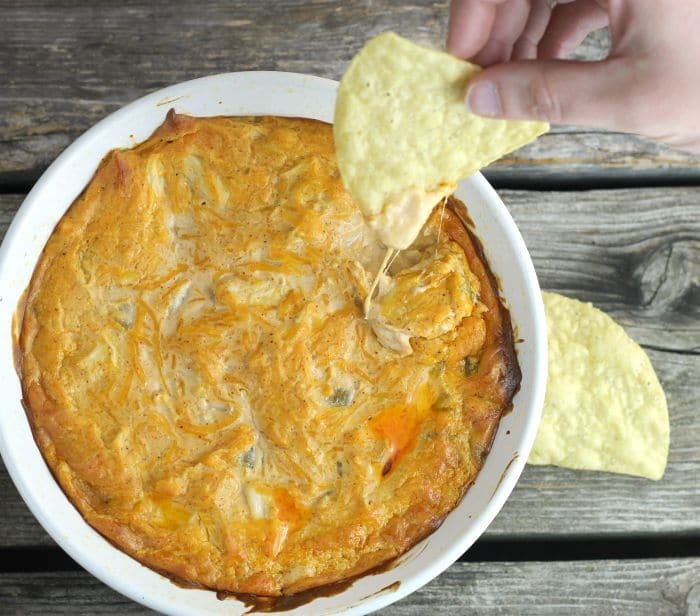 This cheesy chicken enchilada dip is super easy to make. 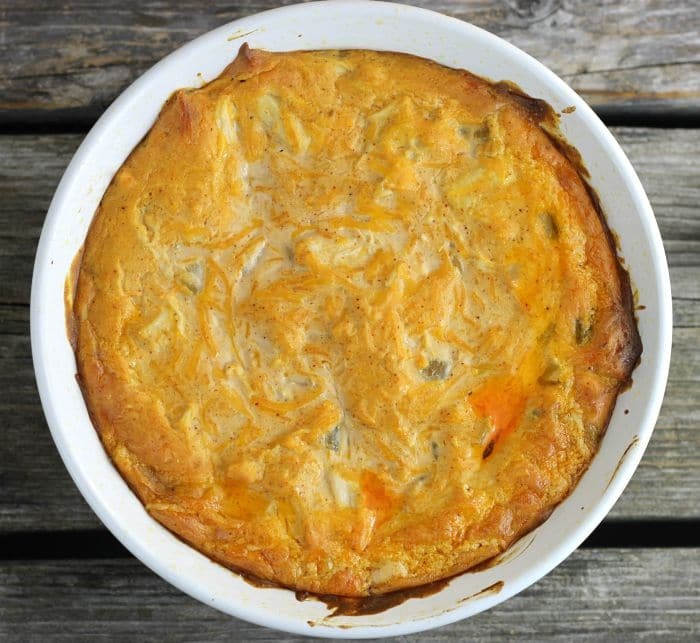 The flavor of the cream cheese, sour cream, and cheddar cheese along with the enchilada blend well together. 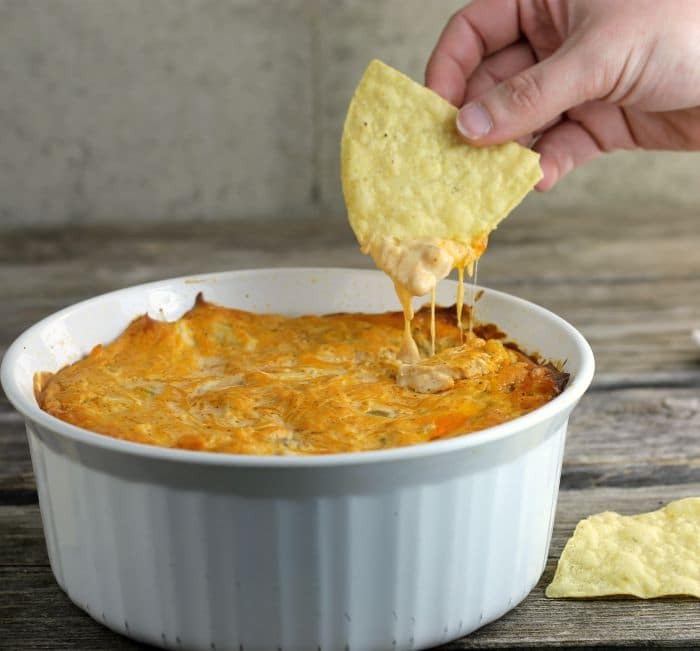 How do you make Cheesy Chicken Enchilada Dip? Blend together the cream cheese and sour cream together. Add the chicken, enchilada sauce, green chiles, onion powder, garlic powder, and cumin and mix together. Blend in the cheddar cheese. Bake in a preheated oven 350 degrees F oven until the dip is melted together. You can serve the dip right out of the oven. What to Serve with this dip? Tortilla chips are a winner with this dip. 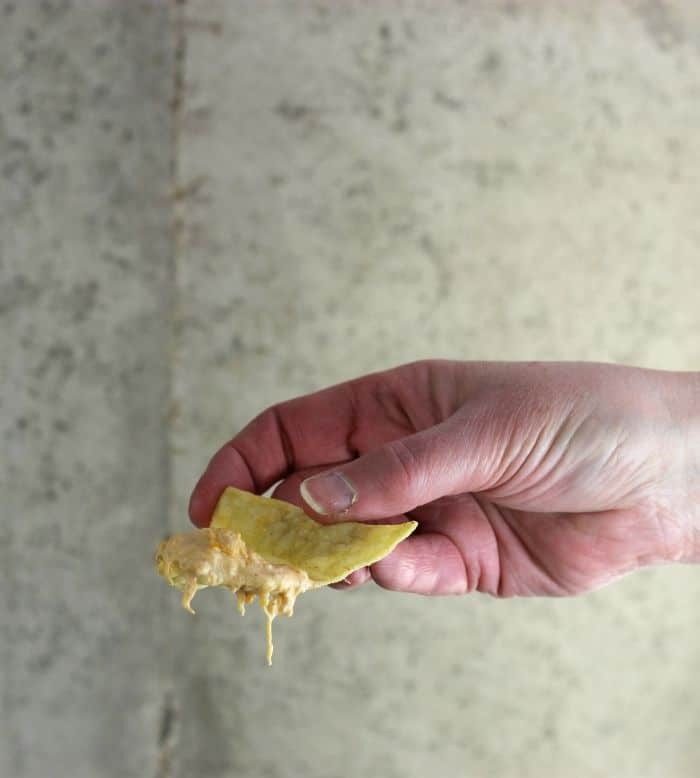 This is my family favorite way to eat this dip. Cheesy Chicken Enchilada Dip is super easy to make, it's a recipe that you mix together, bake in the oven, and it is ready to serve. Put the dip into an oven proof container. (I used a 1 1/2 quart Corning Ware dish). Place the dip into the preheated oven. Bake for 15 to 20 minutes or until the cheese is melted and the top is slightly browned.